Few locomotive builders could claim that they had no skeleton in the cupboard; even the most conservative builders could become infected with an inventor's enthusiasm and the renowned Bristol firm of Fox, Walker & Co was no exception. Its skeleton, described in "Engineering" of 19th November 1869, was never taken beyond the design stage but deserves notice for the elegant way in which mechanical absurdity was concealed beneath a neat and apparently orthodox exterior and also for its incorporation of the first proposals for the use of heavy oil as fuel in a locomotive firebox. 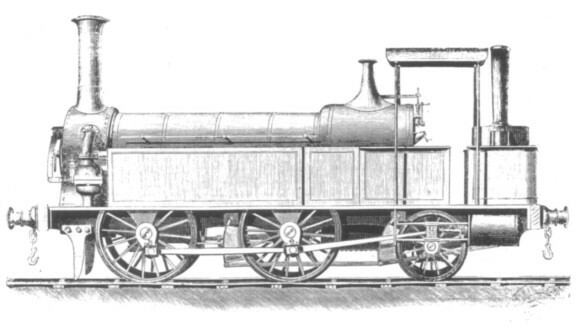 Unlike one or two other oddities described as being "patent" by their promoters, this locomotive actually did conform to a valid British patent - No.2801 of 1869, taken out jointly by Fox and Walker. 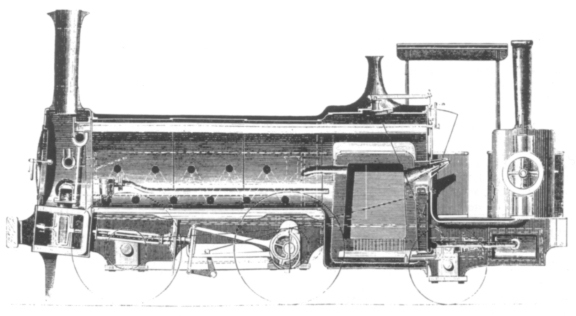 Like some other designs of the period (for example Hurd & Simpson's locomotive described on pages 114‑115 of RECORD 38) the Fox Walker "pneumatic locomotive" attempted to extract the maximum possible amount of heat from its fuel by injecting the products of combustion into the boiler, thus reducing them to steam temperature and at first sight achieving maximum boiler efficiency. However, unlike some supporters of this method, they had foreseen the difficulty of preventing ash from being carried into the boiler and therefore proposed to burn creosote, which has a very low ash content. At the same time they proposed to keep the combustion space at boiler pressure so that their pumps had only to deal with cold air and fuel instead of hot gases. The design as illustrated in "Engineering" was basically an inside-cylindered 0‑4‑2 side tank fitted with a special boiler, air and fuel pumps driven by the motion and an auxiliary steam-driven air compressor mounted on the footplate. Water and creosote were carried in the side tanks. Air was compressed in the two outside cylinders located behind the rear axle, and was fed into the firebox through slots in the firebrick lining. Creosote was sprayed through similar slots by another pump which does not appear in the engravings, provision being made to admit steam to the creosote tank to reduce the viscosity of the fuel and also reduce the work required to inject it. Products of combustion were conveyed forward through the water space by one or more coiled copper tubes which doubled back through a pair of non‑return valves to discharge the cooled gases into the boiler just in front of the firebox. A normal regulator and cylinders were employed, the exhaust being discharged through the chimney in the normal manner or turned into the side tanks to heat the feed water. The small air compressor was used to pump up the boiler when raising steam, the techniques envisaged being to stand the driving wheels on rollers (or jack the locomotive up so that they were clear of the rails) and then run the engine to work the various pumps. Fox Walker stated that the pump was really a luxury as in most cases a hand pump would suffice to pressurise the boiler! It is not difficult to pick out the reasons why such a locomotive would not work. The primary one is thermodynamic: a pound of creosote would require almost twenty pounds of air for combustion and would, with luck, evaporate ten pounds of water. When running, therefore, the boiler would contain a mixture of steam and other gases, principally nitrogen, in the ratio of about one part to two by weight, and about the same proportion by volume. The cylinders were therefore using two‑thirds hot air and only one‑third steam. Now the air pumps would have to do sufficient work to force the products of combustion into the boiler and the theoretical work requirement for this is very little different from the theoretical work output of those same gases when expanded through the cylinders. In practice of course the pumps will absorb more than the theoretical requirement and the cylinders will produce less, so that at best the net work output of the combustion gases is nil. Under such circumstances only the steam will be doing any useful work and as the steam only represents one third of the total volume passing through the cylinders it follows that the locomotive will only produce one third of the power of an equivalent locomotive of normal construction. In practice, however, the air pumps would absorb far more power than the combustion gases could furnish and most if not all of the power developed by the steam would also be absorbed by the locomotive itself. If one assumed that the boiler efficiency was indeed 100 per cent and the locomotive approached mechanical ideality, it would develop only one third of the power output of a similar locomotive with a boiler efficiency which would be at least 60 per cent. At best, therefore, the locomotive would consume twice as much fuel for the same work quite apart from its being much less powerful. Had the locomotive been built I think it would have had extreme difficulty in propelling itself, let alone doing any useful work. The Fox Walker "Pneumatic Locomotive"; as it appeared in "Engineering"; issue dated 19th November 1869.